Homewatch CareGivers is dedicated to providing quality in-home-care that enrich lives and help to maintain the highest possible level of independent living for an individual. Nothing is more important than helping people live dignified lives within the comfort of their own homes in Round Lake Beach. Whether you are seeking personal care services, assistance with physical therapy, in-home care for an elderly loved one, Alzheimer’s or dementia care, required skilled nursing or 24 hour in-home care, we are there to help access services that are tailored to meet the unique needs of each individual client we serve. Our goal is your peace of mind about the quality of services your loved one is receiving. We are available 24 hours a day, 7 days a week to offer you personalized quality home care assistance. At Homewatch CareGivers Northshore, our goal is to provide you with the Best Home Care Professionals in Lake County. You will have many options when it comes to choosing an in-home health care provider in Lake County and whether you are searching for personal care services, assistance with physical therapy, in-home care for an elderly loved one, Alzheimer’s or dementia care, require skilled nursing or 24 hour in-home care, Homewatch CareGivers Northshore will work with you to determine which type of home care service is the most beneficial for you’re your particular situation. Our compassionate and caring team of certified dementia care specialists understand that caring for a family member with memory impairment is stressful and that having a neutral caregiver, from outside your family, can help ease the emotional burden that comes with caring for a loved one. The first step to finding the Top Home Care Agencies in Round Lake Beach is to determine the level of care that is required for your loved one. The second step is to find a home care agency that is caring, compassionate and experienced that can provide you with “real life” client testimonials and customer reviews. 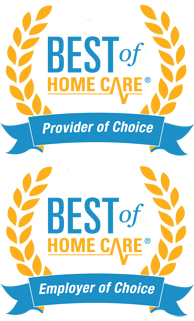 Are we the Best Home Care Agency in Lake County IL? That’s for our clients to decide, however, after reading our client reviews and testimonials, you can take comfort in knowing that many others that have been in your shoes have trusted Homewatch CareGivers Northshore to provide dependable home health care services tailored to meet the needs of their loved ones.